Dana Point Harbor invites families to experience the 48th Annual Dana Point Festival of Whales, March 2-3 and 9-10 from 8 a.m. to 4 p.m. Visitors can explore Dana Point Harbor during the gray whale’s annual winter migratory ritual, and enjoy engaging activities including whale watching, first day Parade and street fair, sand sculpting, live music, the Dinghy Dash, Art in the Park, Chowder Cook-Off, Ocean Awareness Day, delicious harbor eats, educational programs, and much more. Home to over 400,000 common dolphins and five species of whales, Dana Point is the “Dolphin and Whale Watching Capital of the World.” Locals and destination seekers alike can experience the near perfect conditions and enjoy exceptional whale watching year-round. 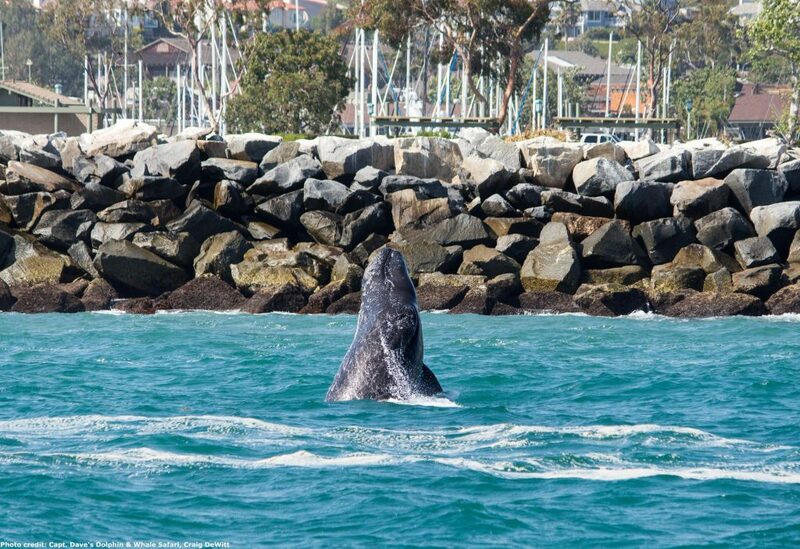 Dana Point Harbor is the ideal location for whale watching with quick and easy accessibility to open ocean. Winter celebrates the Gray Whale and year-round regularly viewed whales include Blue Whales, Fin Whales, Humpback Whales, and Minke Whales.Many believe Dana Point is a reference landmark for the whales and is famous as a gathering area. During their southern migration, they tend to hug the shore. This allows for visitors to approach the whales in a peaceful manner letting us make more intimate contact with them. The Dana Point Festival of Whales, one of Southern California’s largest and longest running celebrations, offers two weekends of outdoor fun and will attract an estimated 50,000+ visitors. Festival highlights include an opening day parade, street fair, art and craft shows and sales, classic car exhibits, stand-up paddling and sailing opportunities, sand sculpting and chowder cook-off competitions, concerts on land and water, environmental activities, educational opportunities, interpretive crafts, kids activities, culinary delights, spirits/beer gardens, and whale watching excursions aboard a variety of vessels.The Festival of Whales Parade kicks off the festivities on Saturday, March 2 at 10 a.m. Attendees can view the parade from the side of Pacific Coast Highway between Selva Road and Street of the Golden Lantern, where onlookers can enjoy the parade featuring giant helium balloons, community organizations and more. Whale watching excursions will depart every hour on the hour, from 8 a.m. to 4 p.m., from the wharf during both festival weekends, offering views of majestic ocean life found off the coast of Dana Point. Prices and trip durations vary.Music has long been a highlight of the Festival and 2019 offers a new attraction, the Ocean Institute’s presentation of Whale Songs & Other Tails from the Opera: A Musical Event with Lyric Opera of Orange County on March 9 at 6 p.m. The performance is being hailed as an elegant evening of eclectic opera, featuring whale songs, cat calls, bird trills, and other operatic animal music, plus refreshments. Experience a variety of events and activities during the 48th Annual Festival of Whales. For more information and to view the full list of events visit www.FestivalofWhales.com and www.DanaPointHarbor.com.